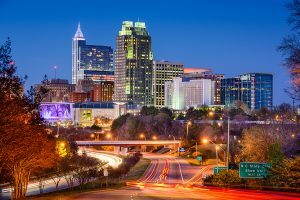 So many new restaurants are popping up in the RTP area! When you think of date night, do you think of some savory Italian cuisine pair with a glass of fine wine? If so, Osteria G is the place for you. Roman-born restaurateur Gianni Cinelli has outdone himself with this restaurant Osteria G resembles an old osteria outside of Rome, the new dining room dominated by a large stone archway, the walls covered with stone or wood, with chalkboard menus hanging here and there. 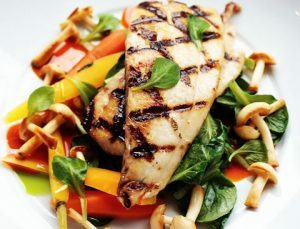 The restaurant focuses on seasonal dishes and will only be serving Italian wines. Oakleaf has found its forever home – The restaurant formally located in Pittsboro has made its move to Carrboro. Oakleaf primarily focuses on seasonal ingredients and updates its menu daily, typically with influences from France and Italy. Handmade pastas, seafood from the Carolinas, and ingredients from the chef’s garden populate the entire menu. This restaurant contains a bar and lounge area, indoor and outdoor dining, and a place to hold private events. Durham- Copa | 107 W Main St, Durham, NC 27701 | Coming Soon! If you’re a fan of the Old Havana Sandwich Shop, then you’re going to love Copa! Roberto Copa Matos, the chef at Old Havana, has decided to open a Cuban cuisine styled restaurant. The inspiration for the menu comes from 19th-century Cuban recipes, and many ingredients used will be grown right here in North Carolina. The bar menu will also draw inspiration from the 19th century through the Prohibition era, during which Havana’s bars became a premier destination. COPA will have their own signature cocktails named after some great men and women from Cuba history. Vegetarian options will be available on the tapas menu. Raleigh- Tonbo Ramen | 211 S. Wilmington St. 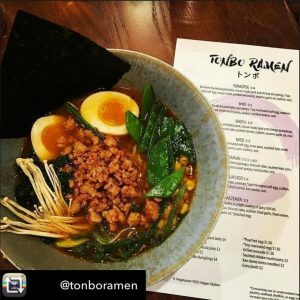 The team behind Kanki Japanese steakhouses just opened the new two-story restaurant, Tonbo Ramen, the downstairs is a complete ramen bar and the upstairs is a Japanese pub, other known as an izakaya – talk about having everything you could ever want in one place. The ramen offerings include porky tonkotsu, soy-based shoyu, as well as a shio and miso based bowl. There’s a vegetarian ramen, a seafood, and a brothless mazemen. The broths are simmered for up to 20 hours and topped with slow roasted pork belly or shoulder, dumplings, soft cooked eggs and pickled vegetables. The izakaya will specialize in small bites to snack on while drinking; lamb, pork, and vegetable steamed buns and grilled skewers of marinated chicken are just a few of the menu items. There will be 12 beers on tap, plus a sake and cocktail list, and for people who want a boozy adult slushies: one rum-based, one bourbon. Raleigh- Wahlburgers | 319 Fayetteville St. | Coming soon! About a year ago it was announced that a Wahlburger is coming to Raleigh, but since then not much has been said – Don’t worry though, last month the Wahlburger sign went up for everyone on Fayetteville St to see! Franchise owner, Greg Prazzo said, “Wahlburgers is fully staffed up, having put its staff in place over the last couple months and now awaits its certificate of occupancy from the city before it can officially open to the public.” So far no updates on whether or not the Whalberg brothers will be making an appearance at the grand opening – fingers crossed.